Welcome to Chewbacca Tuesday! (Wookiee Wednesday would have been better, but too late for that, need a Tuesday post!) Entertainment Weekly named Chewbacca as the fourth “greatest sidekick” (out of 50) — a well deserved status for this lovable, sensitive, masterful hyper-drive mechanic. Notice that four out of five pics below show Chewy with a buddy? That totally supports his high sidekick ranking…and I didn’t seek out “buddy” images, Chewbacca is just usually with a pal. I hope you enjoy these retro Halloween costume pics of our favorite walking carpet. This little Chewy is pretty snazzy. His body language seems to say either “Ta Da” or “Ha-cha-cha-cha!” Or maybe his outstretched arms are meant to be menacing? Semi-homemade costumes are the best, aren’t they? This Chewbacca looks more like a giant plushy than a hairy bipedal humanoid, but I bet he’s darn soft to hug. Great looking Yoda too, love the feet. Remember when you were a little kid and could easily share a velour lounge chair with a chum, so cute. I’m curious, why do the vintage vinyl costumes include a picture of the character on the smock when the kid’s overall look represents the same character? You’d better watch out when Chewbacca teams up with the Boys in White. I’m sure that at any moment Chewy will turn his blaster on that Empire snowman. These old Halloween costume photos sure are fun to look at! Brings back the memories! Is that Chewie in photo 3 flashing a gang sign? I hate to ruin my own post for later this week but … ah, what the hell. 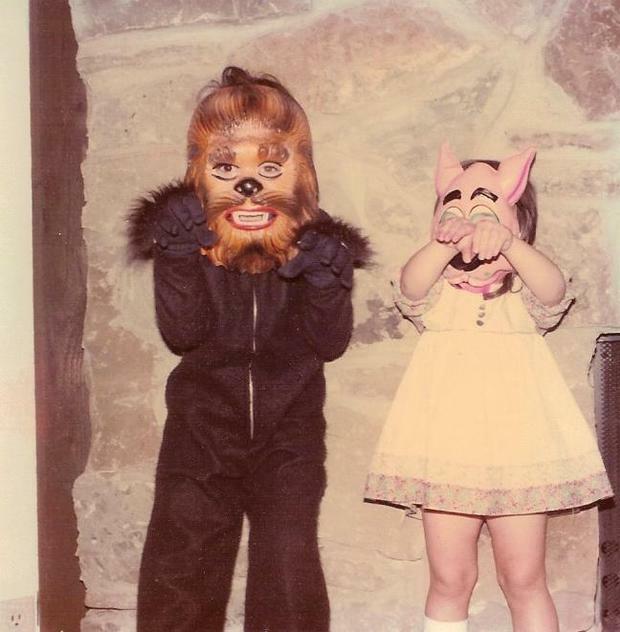 That’s me as “Chewie” in 1978., and my sister as Scooby Doo. Is her Scooby mask pink or has the color just faded? I’m pretty sure it was pink. Chewie’s accomplice in pic 5 is a little short to be a stormtrooper. I’ll bet there’s a Luke mask underneath. Not too short when you consider that kid in the Chewie costume is 8 feet tall! That’s my brother and me in the Chewie and Yoda (with the jack-o-lanterns) circa 1980. I never did understand why Yoda was blue. Thanks for commenting, Dave. We appreciate the use of the great retro pic! I was probably around the same age in 1980 and have similar photos of me and my big sister. It warms my heart to remember back by looking at other sibling duos from the era. Ours is not to question why Yoda was blue, only to appreciate that he was at all.